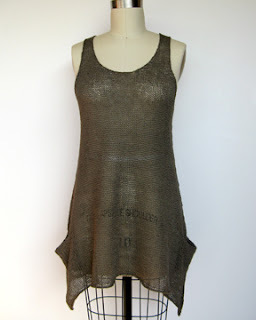 There are something like 1,000ish adult dresses on Ravelry. Some are definitely tunics, and some are skirt/top combos, but I was astounded at how many there were. 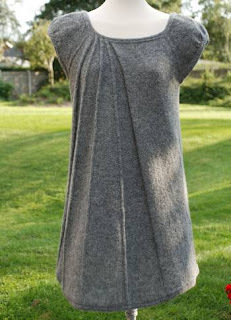 Especially because I'm typically floored when I see dress FOs showing up in the Ravelry forums. It seems to be rare. So I grabbed three layerable choices in different styles for today's post. I like layer pieces because they are so versatile for various weather choices. First we have Liesl, by Julie Weisenberger. I love the sheer fabric, which is a sport yarn on size 8 needles. The uneven hem and pockets are a total bonus. This would be awesome over leggings or jeans, with a tank or long sleeved tee underneath. So cute! Bente Geil's Topstykke is gorgeous for the opposite: it has a defined structure and incredible pleating that makes the piece look like it's made from felt, when it is actually sock yarn on #4s! Wearable and tectonic. This would be great with cute tights and a long sleeved tee, or layered over a lace or chiffon underdress. Heather Dixon's Hattie is my last pick. It's different from the other two, and is fully in the "summer" camp. It's a great beach coverup, but would be cute with long, lacy socks and a ballerina-style wrap to give it a more coquettish look. Dresses scare me: the amount of yarn and the dedication to project completion are a step above sweater knitting, which is currently a 2-3 time per year occurrence for me. Were I more prolific with the needles, I might be more willing to jump into bigger projects with less reserve. Share your favorite dresses in the comments! And link your FOs! I like the first two. Topstykke is very Art Deco like to me. I don't know that I would ever wear a knitted dress though being somewhat on the large size. Liesl has been in my queue forever. I think it'd actually be wearable in Houston if you made it from something like linen. Someday I'll knit it! I love the idea of at least knitted tunics, but the time investment is a huge hindrance to me. I'm also hesitant to do modifications to fit my hips. I found these in my favorites: Still Light and Idlewood. I think larger-sized women can look amazing in dresses, Emma! It's all about finding the right silhouette, I think. Katharine, I see a KAL in our future... Our distant future. Stupid queue is gigantic!